I have made some changes in my kitchen and I'm LOVING the results! I was never completely satisfied with my old kitchen island. I KNEW there was something that I would like better and I was always on the search for it...for 2 years. I finally found it...an antique printers table from the 1800's with the original marble top. I love the patina of my new island! I painted the wood black for some contrast. I had a very specific look that I wanted to create in my kitchen. I didn't have to do a ton of changes to achieve it, thank goodness! 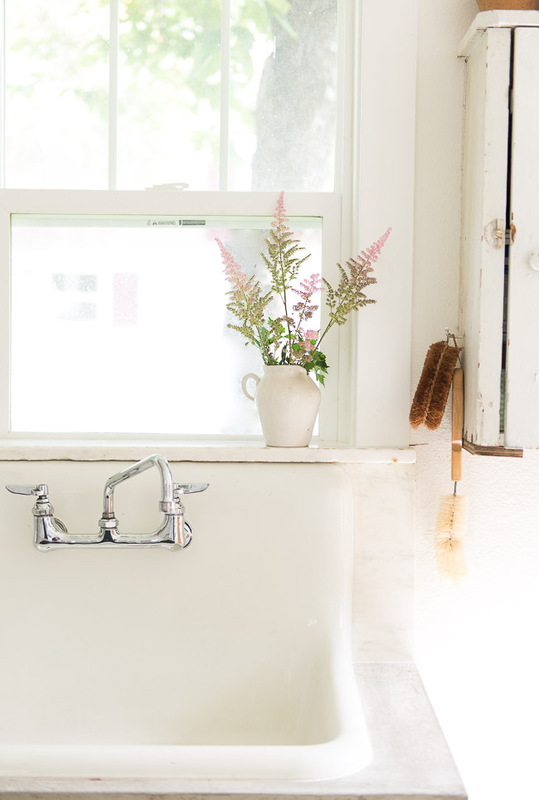 What I wanted to achieve with my kitchen makeover was a design where all the major focal points are layered front and center, and everything surrounding the major focal points does not draw the eye and is very simple. So basically a "POW" of focal points layered inside an invisible frame and everything outside the frame very minimal to make those focal points really stand out! With my wood cabinet already a major focal point, I just needed a dark colored island to layer in front and more color for my shelves. These are what I wanted to draw the eye and everything else surrounding to gracefully disappear. I switched out my light fixtures over the stove to be almost invisible. 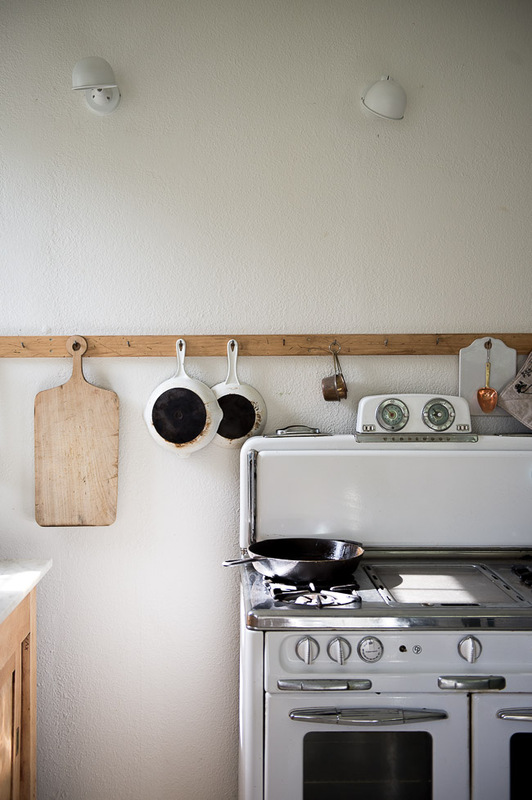 I do have some contrast on this wall...the wood pot rack...but it's just enough to add some interest without drawing the eye away from my major focal points. 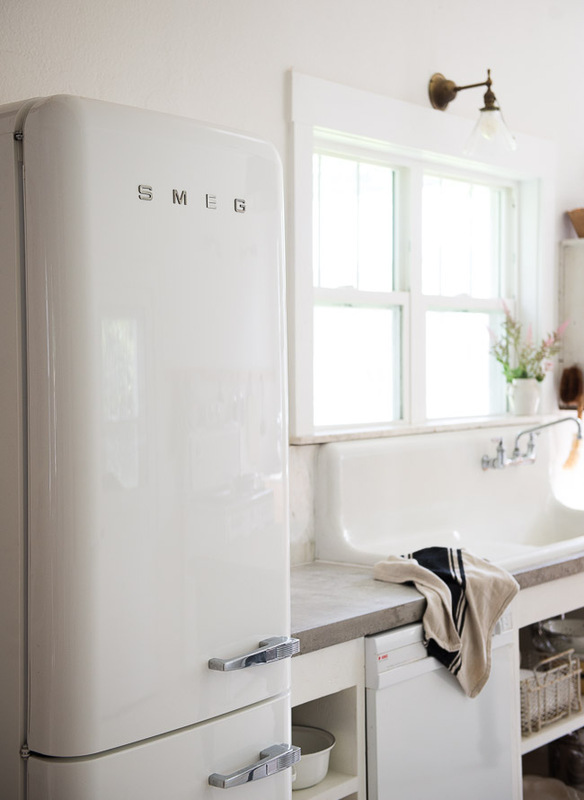 I'd like to introduce you all to my new fridge...what started it all...the Smeg model FAB32UWHLN. Since the fridge is skinnier than our old one, I had some space that I wanted to take advantage of. We really needed a permanent counter over my dishwasher and something to clean up this side of the kitchen. So we took a shot at DIY concrete countertops! We took video of the process so I hope to share that with you soon! But let me tell you my thought process behind designing this counter. I wanted it to be very simple and not draw the eye. 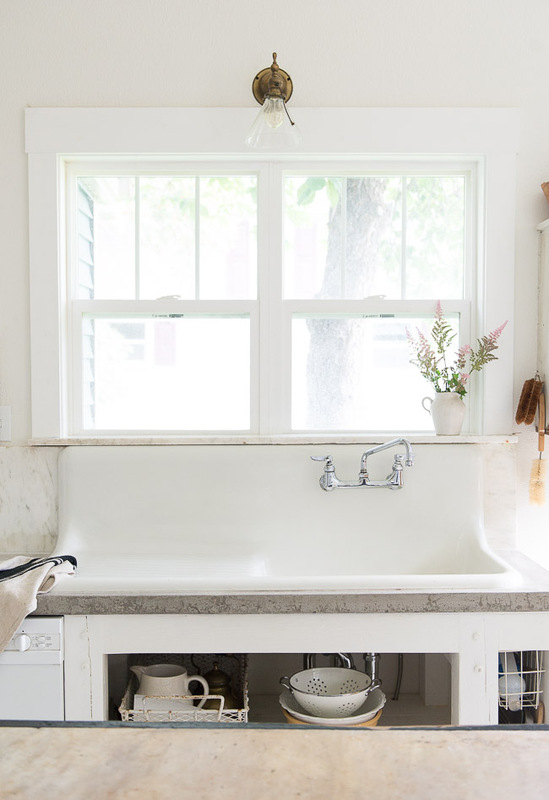 But I knew I loved concrete countertops! I love the very natural look of the natural grey concrete. Since I have marble on my back wall counter and now on my new island, I felt I could do a different surface material without it looking too mismatched. I wanted a light grey concrete so it didn't draw the eye too much. I know you can get concrete in any color but we didn't order ours, we went to a local store and just bought what they had in stock, which was only grey and white. I decided to take a risk and try mixing the grey and white to get a light grey. I love how the shade turned out! Side note: I think this is my husband's masterpiece! 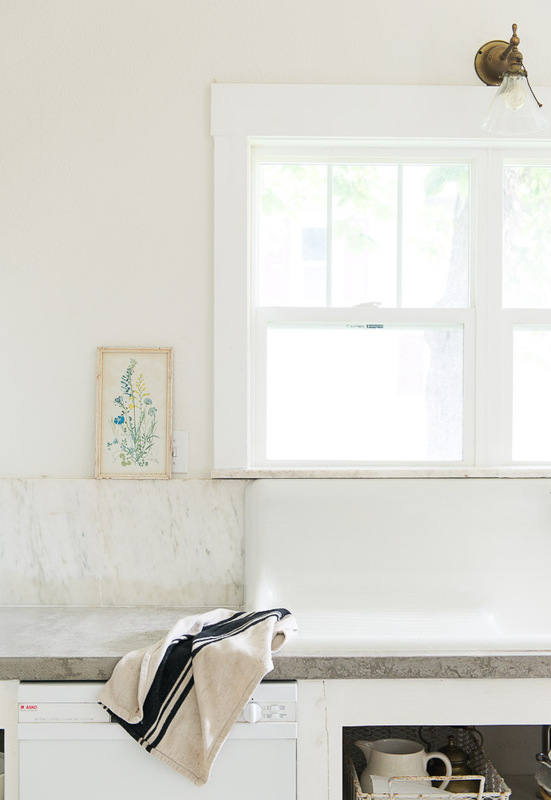 Between the custom cabinets he built and the concrete counter that he made, not having ever done any concrete work before, I think it was maybe one of his most challenging projects, but one that turned out so, so amazing! I wanted the counter to be very rough looking and have a lot of texture. I love how the edges turned out! For the cabinetry below I wanted a blocky look and thick, rough-cut wood. I banged up the wood a bit before painting it. 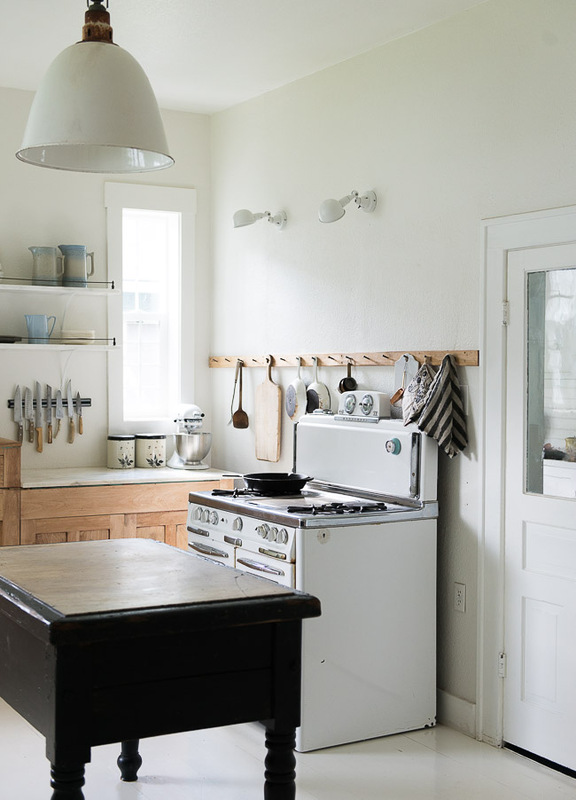 I wanted the wood to look old as well as the concrete countertop, but I also needed it to be minimal and very simple and clean so it didn't distract from my main focal points in the kitchen. My old sink was pretty rough and I found this one on Craigslist! It's bigger and has been re-enameled....which means I need to be careful as I use it. But I knew I wouldn't find one in better shape than the one I had without spending a fortune. So far I've been very impressed with the enameled sink. I had some left over pieces of antique marble and they were just the right dimensions to make a backsplash for the counter. I love love LOVE the backsplash! Since this sink didn't quite fit under my window sill, hubby took out the bottom of the windowsill and added this marble piece above the sink lip instead. I think it's my favorite part!! I designed cubbies for the left of the dishwasher and a simple shelf for under the sink. 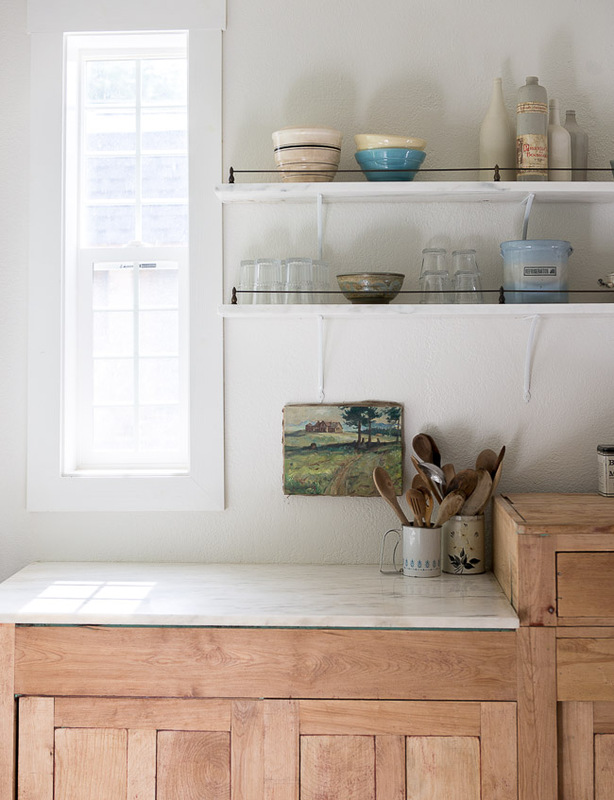 It definitely helps to have more storage in this kitchen! I'm not too picky when it comes to function and conveniences in the home, but I will not ever get rid of my dishwasher! 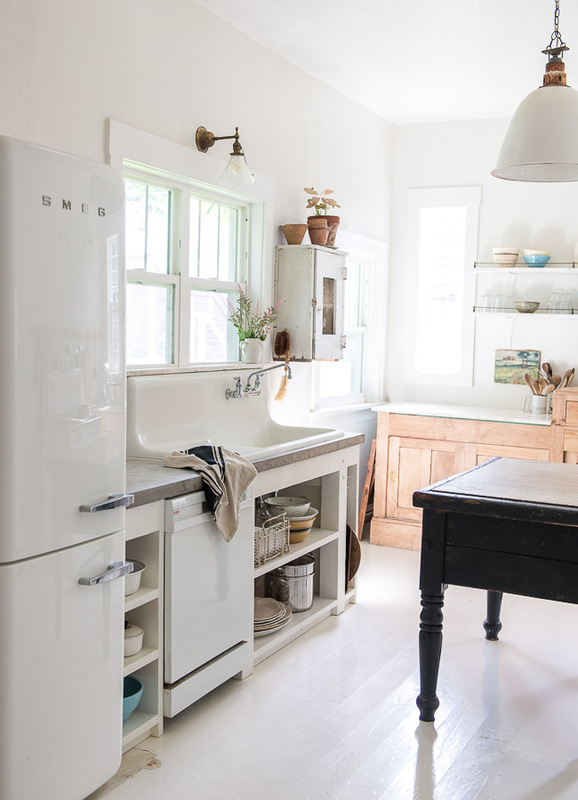 I know doesn't add to the design of the kitchen, but my thought process behind the dishwasher is if it's very simple and plain, it is hardly noticeable. That's a little glimpse into what I was going for and my thought process behind the design of my kitchen. Hope it was helpful! I am so excited for you and am beyond thrilled that I gave you a little inspiration! Dreaming and planning and designing is really the fun part so enjoy that process! Thank you so much! Yes...I need to post on the functionality of it!! I'm in love with everything you created in your kitchen. Always look forward to your posts. Thank you for sharing. Now THIS is a beautiful kitchen!!! Absolutely stunning!!! 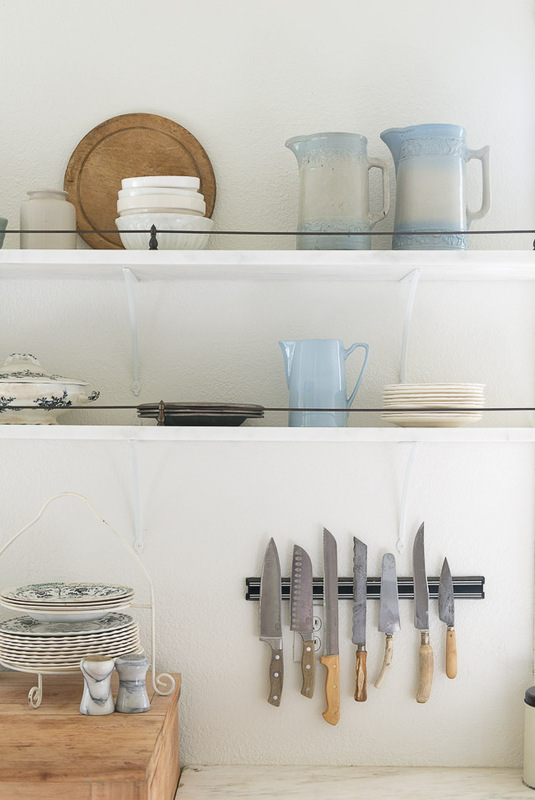 Can you share resources for your light fixtures? 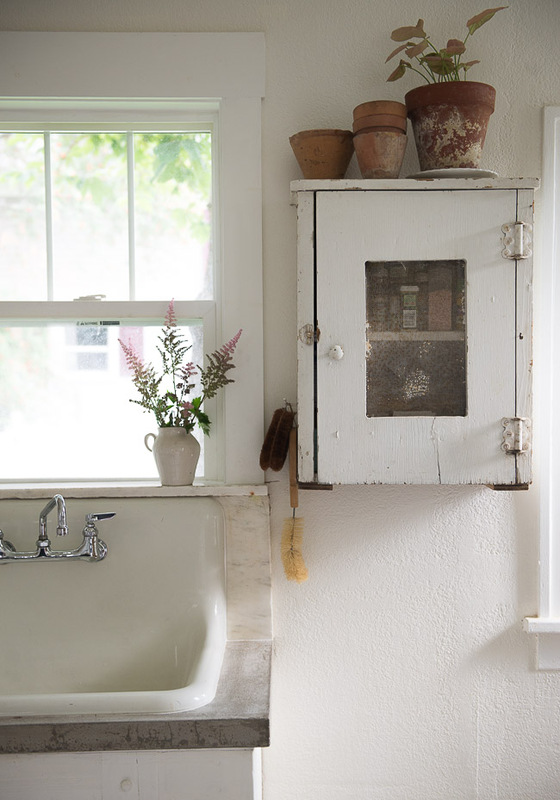 I'm on the hunt for a sconce similar to the one above your sink, as well as the pendant above the island- they're perfect!!!! Those are both vintage. I found the sconce on eBay and the large dome light at an antique show. Those are really the 2 best places to find vintage lighting! Good luck! Your kitchen is amazing, dear one! 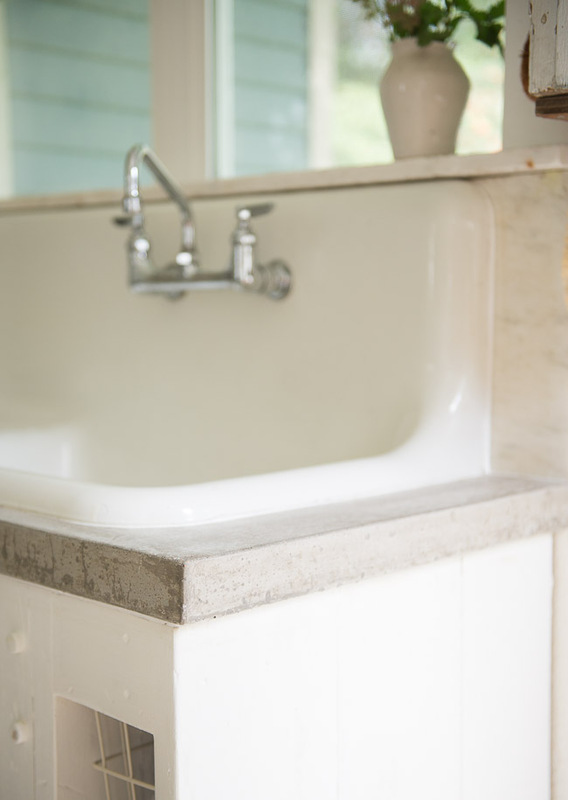 I love the concrete countertop your husband made for you! The island is stunning and functional! Thanks for sharing with us your finished reveal! That's one cutie on the chair! Thank you so much! I hope it was informative or inspiring in any small way. I love all the elements you incorporated in the kitchen. I especially love the countertops and island. All in all it looks fabulous. 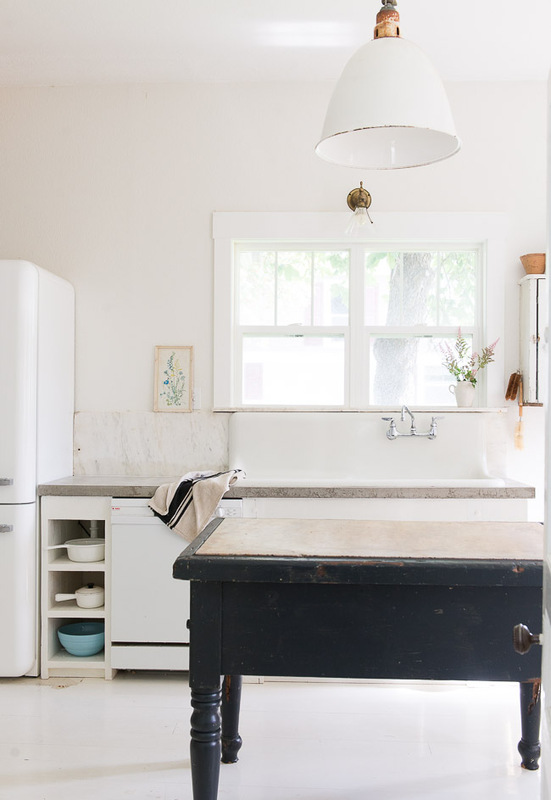 Your kitchen is gorgeous & perfect in it's simplicity & vintage feel. 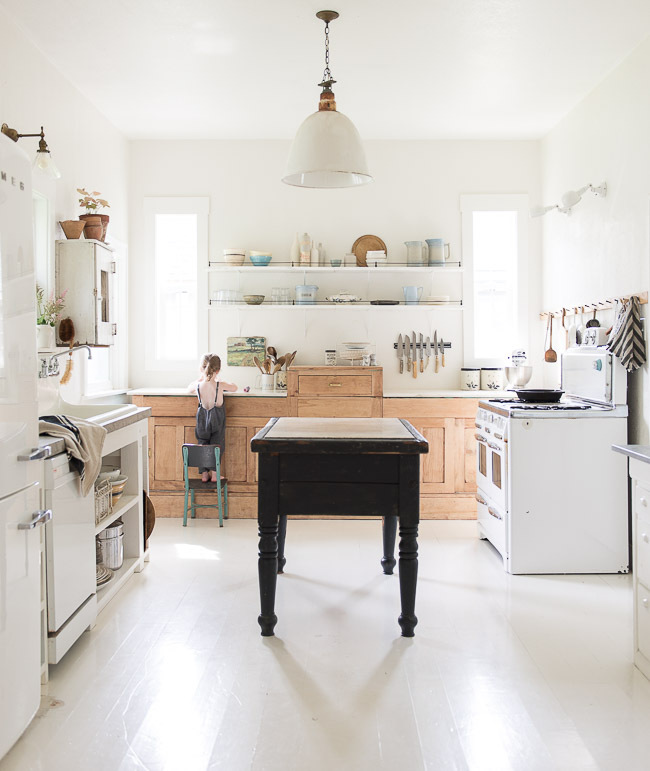 I could spend forever in that kitchen. Great Job!! 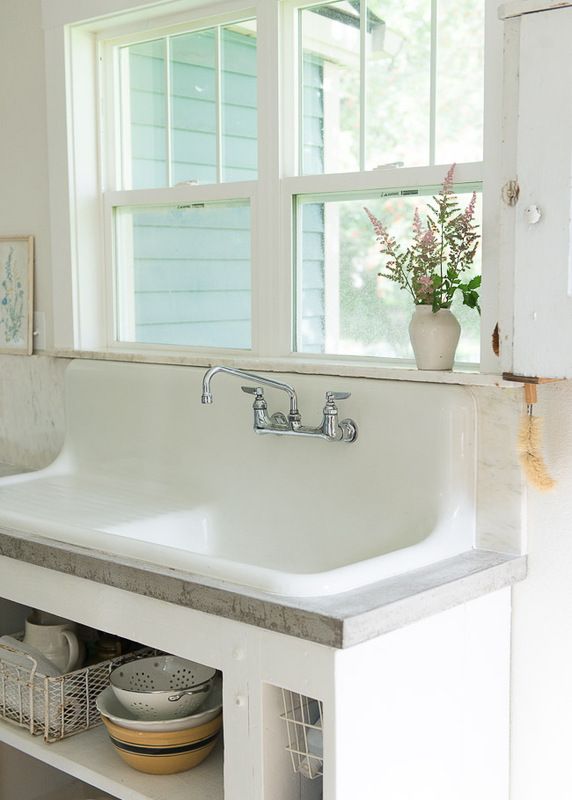 Love the concrete countertops & sink. 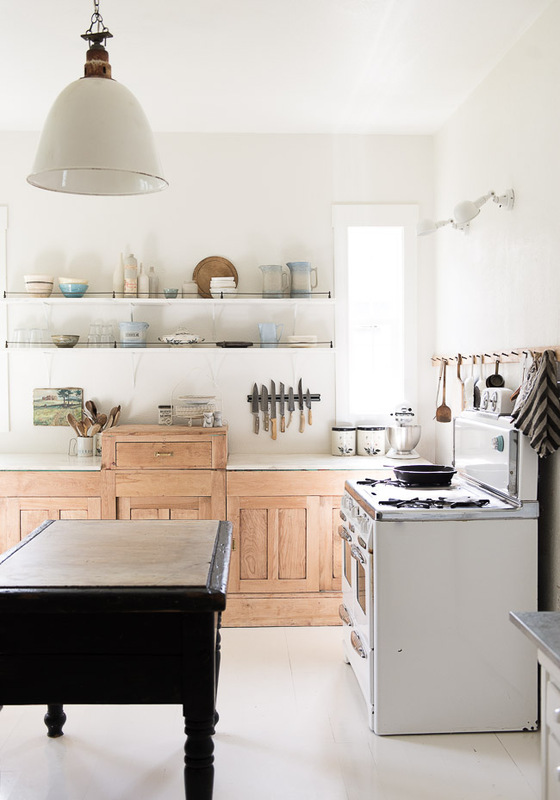 Love that your Kitchen meets all your needs, and yet appears in simplisty. 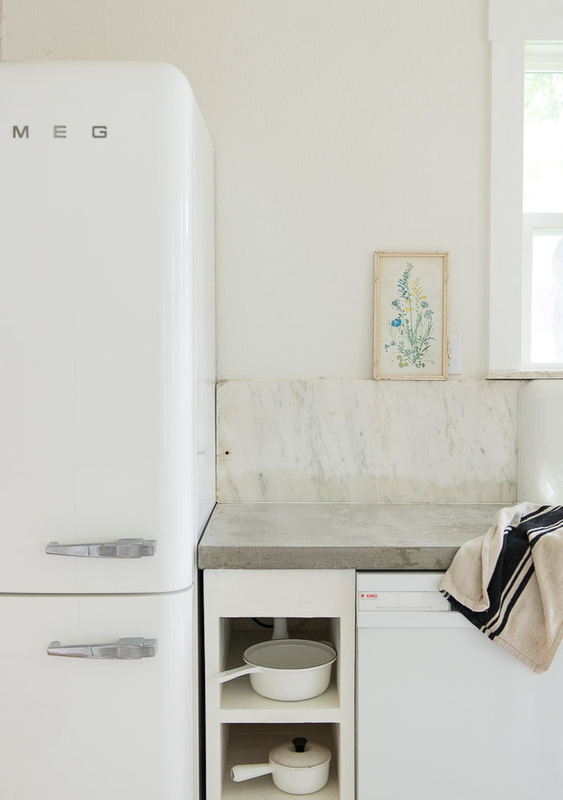 The smeg fridg is great, and the cement counters are a well known suface here where I live with many clients and friends having them. I love them. 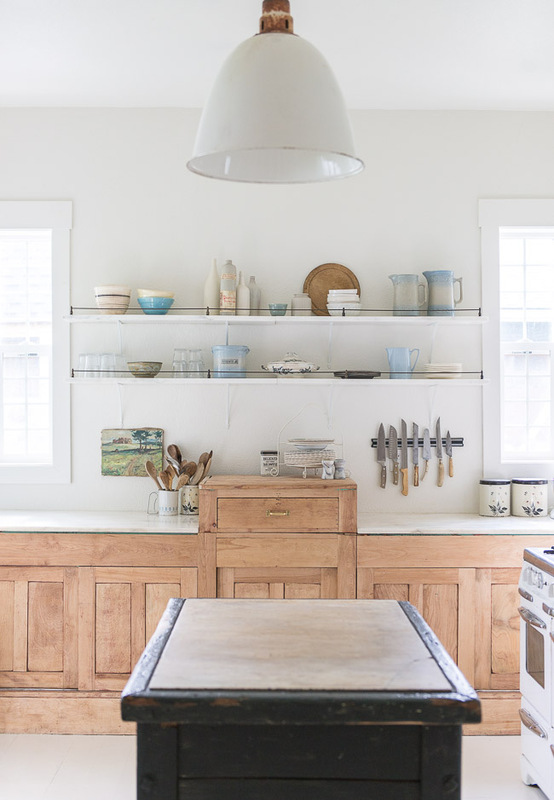 As for my favorite view into your kitchen is those two windows that Flank those wall shelves. 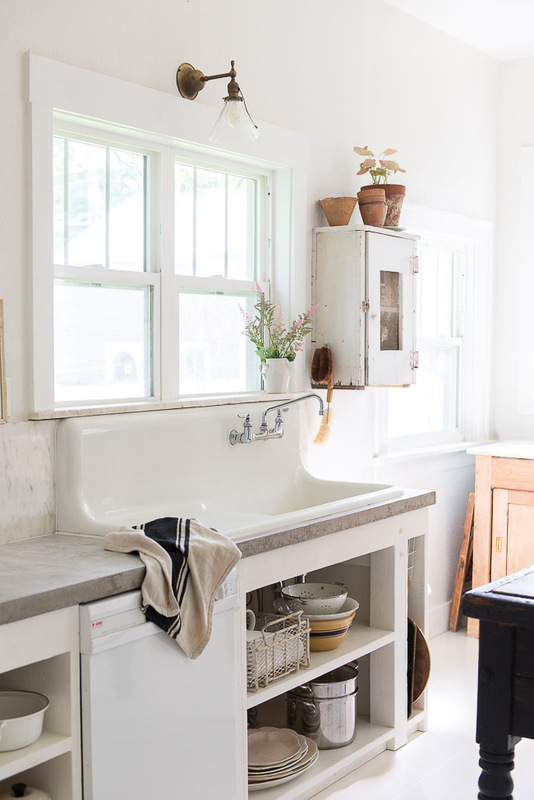 What about that sweet country canvas, another love, and the kitchen sink is a new favorite over the very trendy farmhouse apron sink. 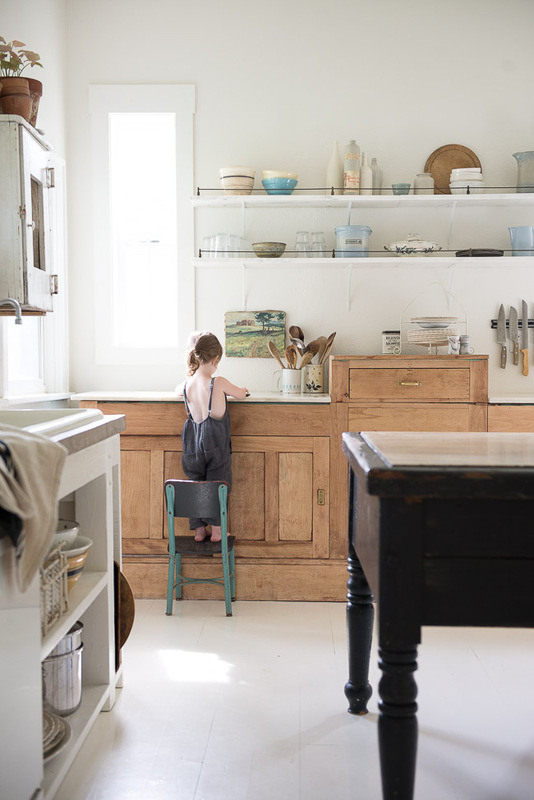 Your kitchen is truly a kitchen to love. I (((love)))) that little brass rail on your shelves!! Will you share your source? If you have this type of kitchen then dishes will making testy automatically. Everything is available in this kitchen. What an incredeply beautiful kitchen you have made. I'm totally blown away. I just love it.